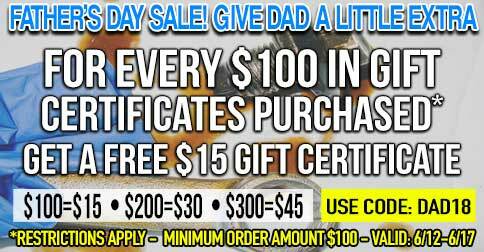 Get $15 Back On Gift Certificate for Every $100 Spent! Home>Get $15 Back On Gift Certificate for Every $100 Spent! Not sure what parts your Dad needs for his project car next? Ground Up’s got you covered! For every $100.00 spent on a Ground Up gift certificate you’ll receive an extra $15.00 bonus gift certificate. For example; Buy $500 worth of gift certificate and get a FREE $75 gift certificate. * You get the point! DAD18 expires on 06-17-18 at 11:59pm est. Coupon expires 06/17/18 at 11:59 pm est. Click Here For Chevelle Parts! Click Here For El Camino Parts! Click Here For Camaro Parts! Click Here For Nova Parts! Click Here For Gbody Parts! *For the $15.00 back offer to apply the order total for gift certificate must be $100 or greater. This offer is for a Ground Up Store credit only, and can not be transferred, or refunded in the form of cash, check or a credit card refund. To be eligible you must spend $100 or more on gift certificates. Example $100 gift certificate = $15 bonus gift certificate, $500 = $75 Bonus. If you spend $450 on gift certificate you will only receive a $60 gift certificate bonus.